If you've been following my reviews here or anywhere else for a while, you know that urban fantasy can often be hit-or-miss for me. There's some urban fantasy I've loved, some that's left me wanting a little more. 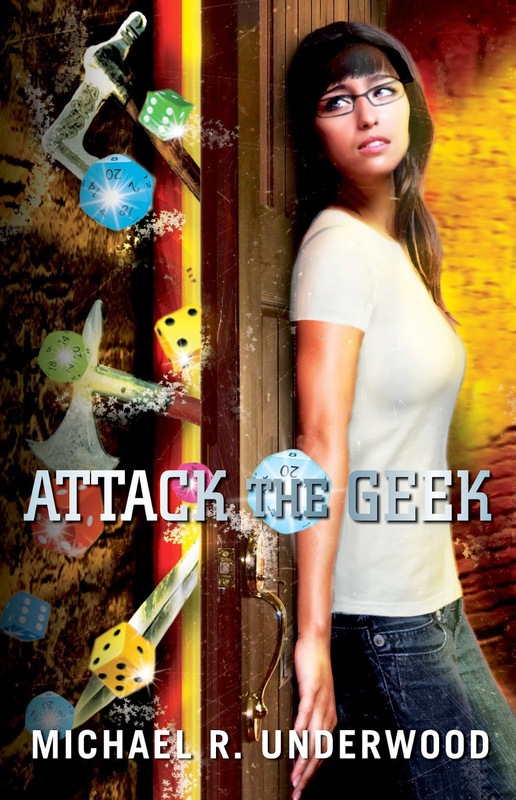 What I have found is that there's a different type of urban fantasy that's been releasing books in a series for the last few years: Michael R. Underwood and the Ree Reyes books: Geekomancy, Celebromancy, and the upcoming Attack the Geek novella, out this Tuesday. While the books have their pluses and minuses, the benefits overall far outweigh anything else, and are perfect for readers of this site: respectful, fun fanservice with a lot of interesting wrinkles. If you choose to read Geekomancy, the first book in the series, it's important to manage your expectations a bit. You're not in for a revolutionary literary experience or some sort of significant exercise in worldbuilding like with other fantasy series, as the story is rather pulpy and quick in that regard. It instead relies on a unique magic system that has the geekomancers pulling from nerdy popular culture to achieve whatever they're looking to achieve. So, for example, when our Heroine Ree needs to combat dark magic, she may tear up a Magic: The Gathering card. If she's looking for strength, she might watch a Marvel superhero movie. It's an interesting take on existing magical tropes and ideas, for sure. The true bonus for the stories, though, is that it's truly fanservice in book form, with characters that do what many fans of many things wish they could. It's a geek reference a minute with a plot tacked on, and I have to credit the book for being fun and readable without trying to be something it isn't. Yes, Ree ingests all manner of nerdy things over the course of a book, but she's also quoting liberally from Firefly, making references to Doctor Who, and so on. I'm sure I missed a number of the references along the way, which really speaks to the breadth and volume of where Underwood goes with the story. The series continues to move forward in these veins with the sequel, Celebromancy (which involves celebrities who actually use the power of fame to fuel their magic, a nice subversion of the existing system), and the novella Attack the Geek, which is, in a lot of ways, a short D&D one-shot campaign in capsule form. Both books do a good job of building on the existing pieces established, with the new novella offering what might actually be a more fun way to handle the systems on a whole. In some ways, I enjoyed the novella more due to the pacing, even though it loses out on characterization somewhat (as everyone's already established). Overall, this is a fun series that I think readers of this site would really enjoy. Respect to a series that is forging its own course, and doing so extremely well. I already can't wait for the next entry.